Do you want to know what you will find at Illa Fantasia? 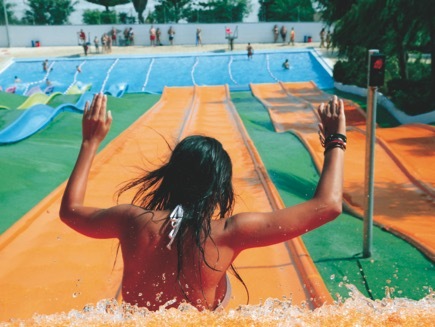 More than 22 slides, 3 giant pools and a big picnic area. No hurry, no queues, kind staff ready to make sure you spend an unforgettable family day. 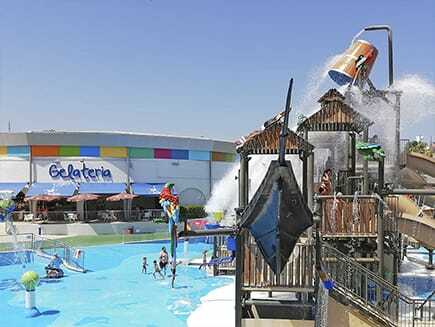 Illa Fantasia, Barcelona water park. By train, car or bus? Our water rides make our park a unique place for the summer. We can tell you about some of them, but you will need to come and enjoy them to know what we are talking about. Only for brave and bold people, not afraid of strong emotions. Go down from 15 metres high, choose from the three different options of closed tubes. Each of these tubes has a different intensity and each one is better than the other. In a little more than 10 seconds you will experience so many sensations that you will be thinking of getting on the ride again as soon as you fall into the water. Lots of fun guaranteed, as this ride takes place inside a tube. An exciting fall into the water, full of twists, from a 10-metre-high tower. The sunlight only gets through the structure of the slide, which produces an effect that can only be enjoyed from the inside while going down. Twist down the three turning slides above one of our restaurants . Enjoy the steep falls, the breathtaking twists and all the emotions that you can come across with. Get the adrenaline rush of an extreme 18-metre-high drop, where shouting won’t help! Thanks to its inclination and height, Kamikaze offers an extremely fast descent of less than 5 seconds at a speed of more than 60 km/h. 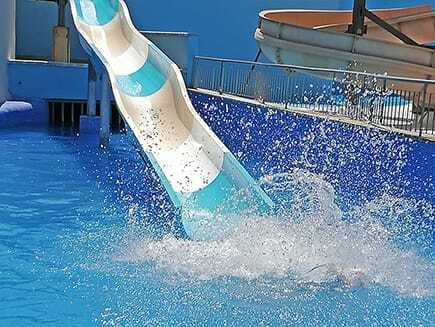 It’s known as the most extreme slide in the whole park, a ride that ends with a relaxing dive in the pool. If you are looking for excitement but you also want to enjoy the sun, this is your pool. Like on a Caribbean beach but without the annoying sand, you will be able to play on the shore or walk into the water smoothly until you get to the deepest part, 1.80 m deep. 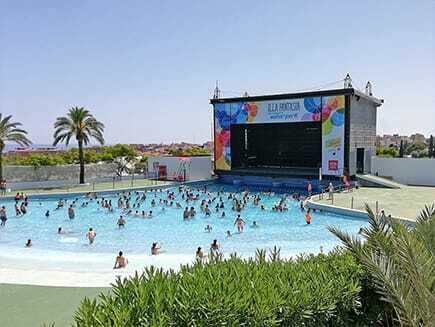 This is the biggest pool in Illa Fantasia, with 2000 square metres and more than 2 million litres of water. In order to go down Rio Salvaje, the visitors will have to ride a floatie. 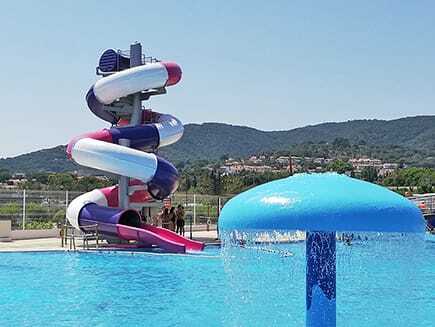 This is a huge water slide of more than 180 metres of length, it crosses over the picnic area and shows those who decide to ride it an outstanding view of the park. 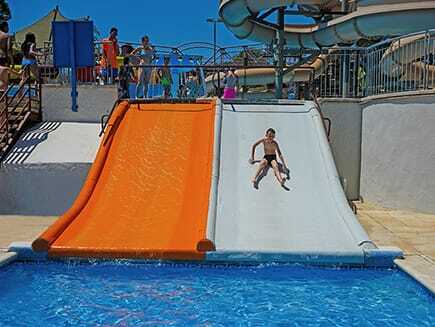 Despite its name, the guests, in pairs, will enjoy a mild and smooth descent down the slide. The Garden of earthly delights is formed by several tubular sculptures of about 12 metres high, from which the water falls. 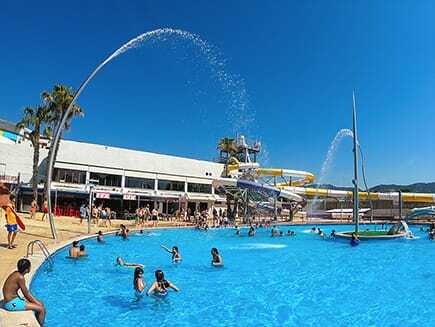 They are situated around two large pools of over 1000 square metres. It is the children’s delight, and the adults’ joy, it’s for all ages. A space that, at night, offers an amazing spectacle with LED’s lightning technology, which enables dynamic color changes. 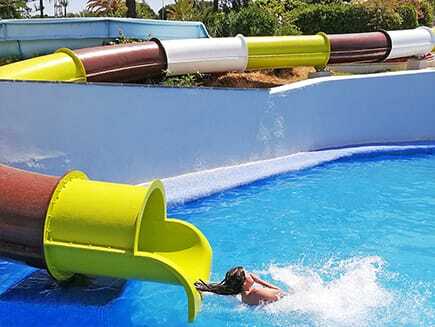 A two-lane super slide with a total area of 4 sliding metres. Go down on this soft surface and enjoy the 10-metre fall, where you will experience incredible and unique sensations, as you feel the water splash on your face on the way to the pool. 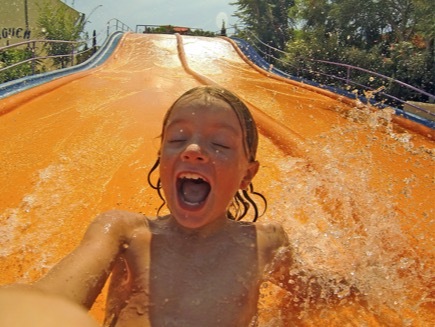 All the excitement of a closed water slide, which allows you to calmly go down in circles and end up smoothly in the pool. 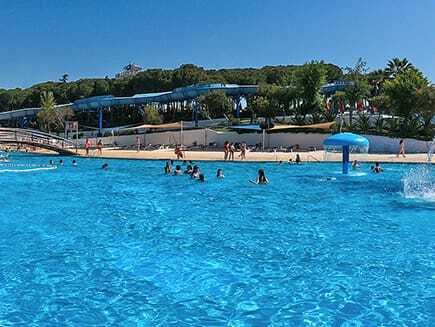 Because it is unique, it has been the site of several commercials, and it is also the favourite place for most costumers when they come to visit our park. Sunbathe or relax in one of our hammocks while you look at the excellent views of the area that you can see from this pool. A shallow pool of 1,50 m deep and of over 1.000 square metres wide. Endless fun on this attraction! It consists of two slides, one of them covered. Go up and down this ride as many times as you want, it is easy, you’ll go down fast and there are rarely queues. So you can totally enjoy it without limits! Three slides: three different ways of entertainment. From the top of this tower, you can go down these slides, which are a classic in our park. Each one is different from the other, but as exciting. 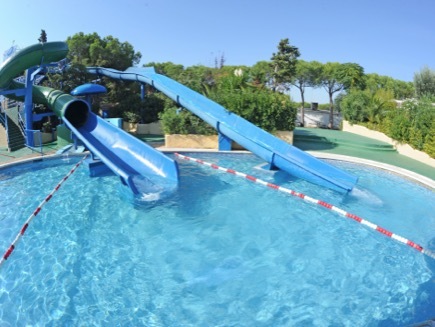 Total fun and a rush of adrenaline guaranteed, as you travel down the zigs-zags between the vegetation of the park, ending in the same pool. The zigs-zags will make everybody happy, especially those who want to experience a race. You have never experienced anything like that. Ride the slide lying down on the dizzy drop before reaching the pool. 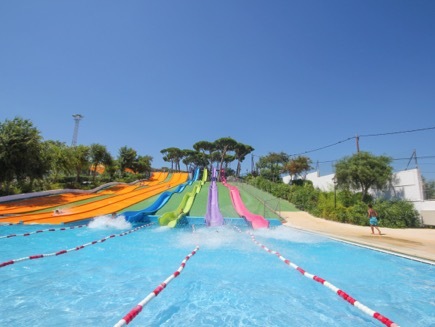 A 20-metre high-speed slide with 3 different lanes, full of splashing and turning. Certainly a unique experience. One of the most popular attractions in the park. It has 4 separate lanes made of a spongy material which makes this ride a super slippery one. The soft lanes have a straight fall with three different drops. You can come down in different ways. If you like speed, be bold enough to lie down; if you prefer going more slowly, just sit down. This ride gives you the possibility to challenge and race your friend to see who gets to the water first! This is certainly the favourite attraction of the little ones. They will have the greatest fun on their own or with their parents. This soft slide ends in a shallow pool (less than 1 meter high). Anyway, we remind moms and dads, to look out for their children all the time! 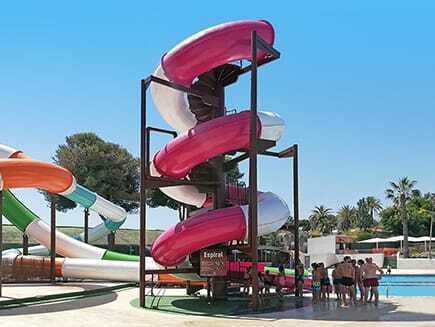 These 4 slides will make you go up and down at full speed and will for sure give you an adrenaline rush. Here you will find twists, turns, rises and falls like in a conventional roller coaster, but combined with the fun of a water slide! This is a short but fast slide, a tube full of turns and slopes. Sit on the starting line and wait for the lifeguard to say ’go’. 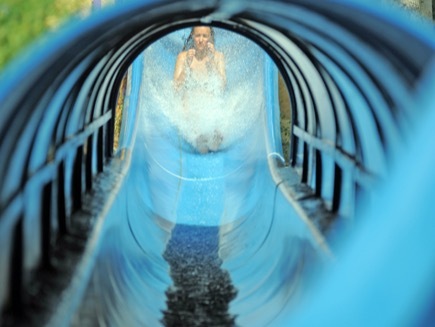 Then slide down the watery tube. How fast can you go?. Torpedo is a unique attraction for its height, its drop and the fact that is a closed tube. Incomparable feeling and in the dark! Go down this ride to discover the excitement of a fast slide full of jumps. You will never get tired of riding it to enjoy the feeling it gives you again and again. Escape from our Labyrinth by going up and down for all kind of slides: Slip, slide, dodge the jets of water, and feel 800 liters of water falling from our bucket to end up becoming a real pirate. Inside the Park, you will find everything you need to enjoy a special day. And if we don’t have something you need, we can get it for you. Will you put us to the test? Illa Fantasia has a cash dispenser located at the front door. There is no need to put on your swimsuit at home. Illa Fantasia has a space where you can change your clothes. And if you come with toddlers, we also have changing rooms for them. Before and after using our pools, Illa Fantasia has some showers for all those guests who want to have a shower. Illa Fantasia has a photo service that will allow you to have a souvenir of your visit to the park. At the entrance to the park, without any obligation of purchase, our photographers will take a photo of you. You can then collect it when you leave, as a souvenir of your stay. You can also contact our photographers at any time during your visit to take a picture of the moment you choose. If you want to enjoy the comfort of sunbathing, this is the service for you. Illa Fantasia offers all the costumers a rental service of hammocks. A little supermarket located in the middle of Illa Fantasia. You do not need to bring many things, in Illa Fantasia supermarket you’ll find everything you need for your visit to the park, and at a guarranteed low price. Warm bread every 30 minutes, charcoal for barbacues, "all i oli" sauce, and many other products. The park has baby changing stations in the toilet facilities for all the guests who need it. Illa Fantasia has 6 toilet facilities throughout the park. 3 of them are adapted for disabled people. 900 picnic tables and 100 barbacues will delight the nature lovers. Illa Fantasia gives its guests the oportunity to enjoy a family meal in this unique space while visiting the park. Don’t forget to come to our souvenir shop. You will find everything you want, to remember your stay in Illa Fantasia waterpark. And if you forget your swimsuit, we also have a wide variety of models for you. We have a self service in order to let our customers choose what they like the most for their meal. Pure American style is the burger restaurant Illa Fantasia has, which will delight the young ones and also those who want to give themselves a treat. Inexpensive and delicious menus. Coffee or tea. Such a nice opportunity to enjoy a good cup of coffee or tea, while resting after a day full of emotions at Illa Fantasia coffee shop. Come and try our waffles, pancakes or enjoy our ice cream. You must stop here during your visit to Illa Fantasia waterpark. You can give yourself a treat or just enjoy a good cup of coffee. Enjoy a paella with your family, or a delicious platter in the middle of Illa Fantasia waterpark. Menus for all the family. You can enjoy the pizza of your choice during your stay at the park. Pizza menus available. Grilled meat, roast chicken with garlic mayonnaise or any other sauce. One of the main attractions at Illa Fantasia waterpark. What are you waiting for to buy your ticket?? Adventure and fun are waiting for you! What would be a summer without Illa Fantasia? 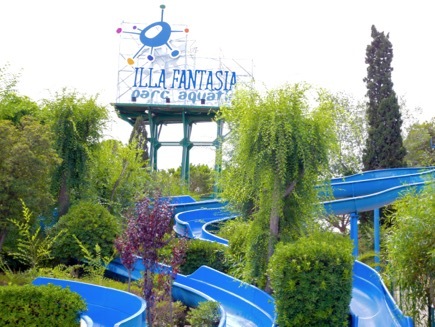 From June to September without interruption, Illa Fantasia is open for those who want to enjoy the summer. you can visit the park during the following opening times. From 10:00 AM to 18:00 PM. From 10:00 AM to 19:00 PM. On the 07-07-2019, 13-08-2019, the park will be closed to the public for a private event. Our rates go by height. If you don’t know your height, don’t worry, we will measure you at the door. With your entry ticket, enjoy a fun day full of adventure. More than 8 hours of entertainment are waiting for you in Illa Fantasia. height between 0,90 m and 1,20 m.
Height ≥ a 1,20 m.